Stayed Jul 11 We were extremely happy with our holiday in Cheong Mon. The villa was modern and well appointed and there was plenty of room for everyone. The location was great and handy to everything you need for a family holiday, including the beach, restaurants and a great beach bar. The staff were always friendly and the ladies that cleaned the villa were so lovely to my two year old son, and made him elephants out of our bath towels, which he was thrilled with. We will definitely go back for another family holiday in the future. Located in an exclusive residential community on the outstanding north east coast of Koh Samui, this luxury 3 bedroom garden villa for six people is just a short walk from beautiful Choeng Mon beach with its glistening white sands. 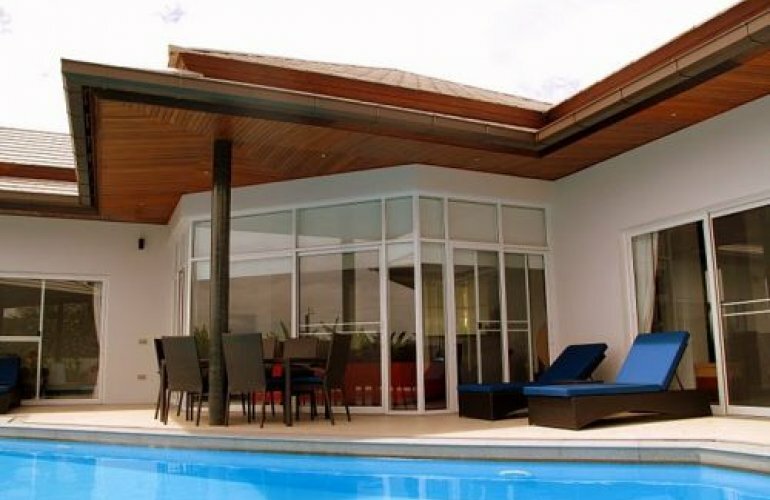 It is a 10 minute drive to the airport, and 30 minutes to the Santiburi golf course. The quaint "Fisherman's Village" at Bophut and the main tourist centre of Chaweng, with its numerous restaurants, shops and lively entertainment are also just a few minutes drive. Other local facilities such as shops, restaurants, ATM machines and Internet cafes are within easy reach. The design of this luxury villa means that each bedroom as well as the living area opens out onto the terrace, the gardens and the large 60 sqm swimming pool. The villa has ceiling fans and is fully air conditioned throughout. Quality furnishings are provided throughout and the bathrooms are large and beautifully fitted. The garden sala has a ceiling fan, and two loungers, for guests to relax comfortably in the shade. Cushioned sun loungers are also provided on the pool terrace on which to take the sun, and there is a tea table for light refreshments and drinks. An outside shower is great for a cool down, or after a visit to the beach and before taking a dip in your own private pool. The open plan living/dining and kitchen area has comfortable sofas and chairs, and a dining table for up to six guests. The kitchen is equipped with western style fittings and equipment, and the sitting area has a large satellite flat screen TV/DVD player for your entertainment. Also in this part of the villa is a guest washroom/laundry room. Complimentary WiFi Internet is available in this property for guests' use. Each of the three en suite bedrooms is spacious and provided with quality furnishings and ample built-in wardrobes. Access to the outside pool terrace is possible from each bedroom. The Master suite has a king sized double bed and the bathroom has a Jacuzzi bathtub, twin wash basins and a shower, while the other two en suites have showers. In the other bedrooms there is a choice of either a queen sized double bed or twin beds. To reserve this villa we require a completed booking form and an initial deposit of 35% of the total amount due. For bookings of less than 1 week (3 - 6 nights) or for bookings made within 8 weeks of arrival, full payment is required at the time of the booking. Payment of the outstanding balance must be received at least 8 weeks prior to arrival.